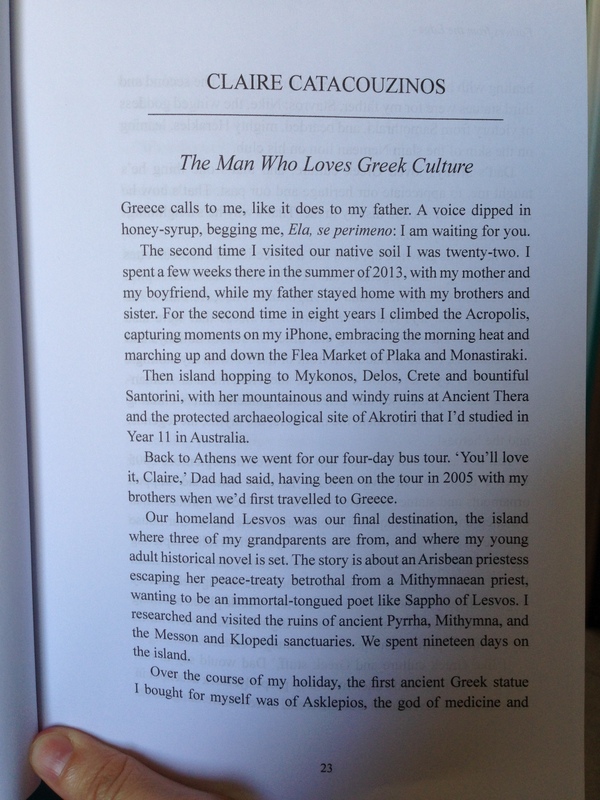 My memoir “The Man Who Loves Greek Culture” in the new anthology by Owl Publishing, Fathers from the Edge in 2015. 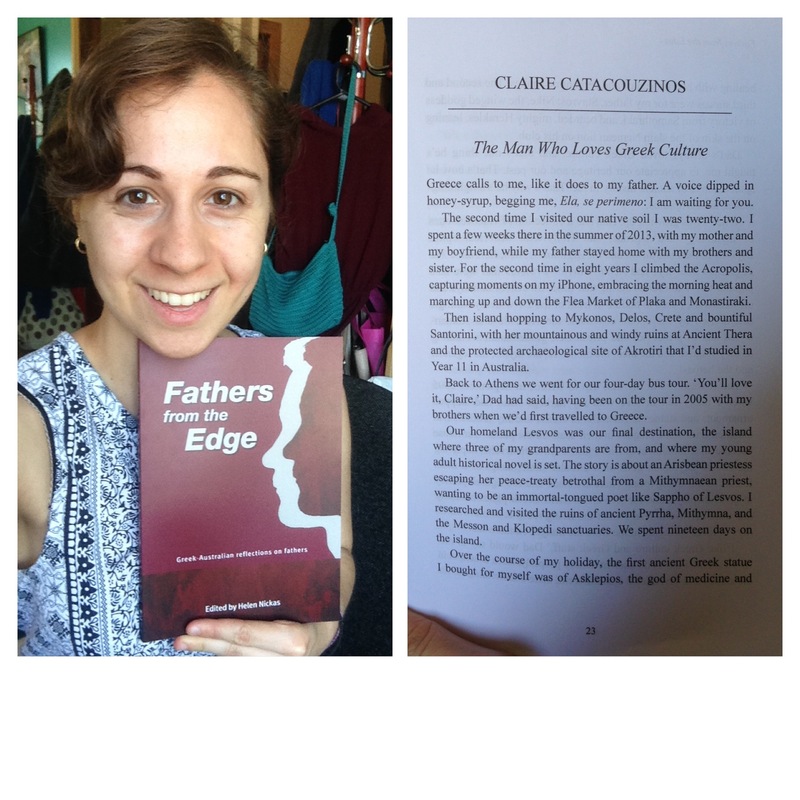 At the end of July 2014 I was invited by Helen Nickas, Publisher of Owl Publishing (Greek-Australian literature), to write a new prose piece for a forthcoming fathers anthology titled, Fathers from the Edge, a companion to the book Mothers from the Edge published in 2006. I decided to write a memoir about how my father’s migrant experience has influenced my relationship with him. This was the first time I delved into writing creative non-fiction. It was tough and exciting at the same time. I remember struggling to write down my thoughts; I had heaps of things to say, and then I had to try to find the right angle to start. It was a very cathartic experience to sit back and reflect on my relationship with my father. Unlike some of the other 24 writers in the book, my father is still alive, and I’m one of the youngest contributors to the book. So I decided to interview him one night when I realised I had small gaps in knowing the history and biography of my father’s experience migrating to Australia. And by interviewing him, I was able to further understand why things are the way they are: his personality, mentality, values, and attitude towards life. I’ll never forget that night. I then had to figure out the structure and balance of my memoir: incorporating Dad’s biography and my memories and experience. And that’s how I generated my memoir for the anthology. Lastly, I also wanted to say a huge thank you to fellow writers, Ally Bodnaruk, Cassandra Cochrane, and Brendon D’Souza for workshopping my piece at the beginning stages of my first draft. You guys are amazing! Thank you so much for your constructive feedback!